Owning a dog can be one of the greatest pleasures in the world. Friendly canines can bring joy to people and families alike. They can provide companionship, guidance, and even rehabilitation to their owners and can truly make a house a home for some people. Having a dog in your household is a great responsibility and can be quite an undertaking for any individual or family. You’ll need to learn about owning a dog in the state of Missouri and the steps you’ll need to take to properly train your dog and keep them happy for years to come. Missouri has several laws in place that govern dog owners. These laws protect dogs, their owners, and other civilians. Dogs Worrying Livestock: If dogs, defined by law as any variety of the canine breed, cause stress or physical harm to a person’s livestock, the dog can be punished. This punishment is typically death to the animal. Animal Care Facilities Act: This defines the conditions that must be met by breeders, boarders, and animal shelters in the state of Missouri. The act states the quality facilities such as these must be kept in to harbor animals as well as sets standards of feeding, watering, care, socialization, and record-keeping. Dog Bite Law: An owner is responsible for damages if their dog bites someone without provocation. Licensing: Dogs must be tagged and licensed within their district. Owners can obtain a license for their dog when it is six months old and has been vaccinated for rabies. Owners of dogs without licenses may be fined by the state. These laws make it vital to properly raise and train your dog to prevent damage to other people and their property. Protect your dog by properly training your canine. Once you’ve completed training, reward them for all of their hard work and compliance! 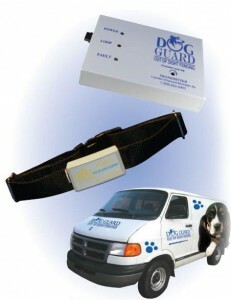 Give your dog freedom to roam about your property any time of day when you buy an electric fence in MO from Dog Guard. Purchasing an electric fence in Missouri gives you total control of your dog without having to tie them down. A wireless dog fence is completely hidden from view, out of sight of homeowners and neighbors. With an electric dog fence, MO children won’t run the risk of tripping and falling over messy chords or bulky boxes. Dog Guard has been providing pet fence services since 1988 and has developed an industry-leading wireless dog fence that is immune to any type of electronic interference. Giving your dog an electric fence in Missouri is a simple process that is completely customizable. You set the boundaries you wish to contain your pet within. Your dog then wears a comfortable collar that will emit a signal to prevent the dog from exiting your yard. If your dog persists, a stronger signal will be sent out to prevent the dog’s escape. Once the hidden fence is installed in your yard, flags are placed around the perimeter you designed. You can use these flags to train your dog on their new boundaries. Walk them around the inside of the perimeter and use verbal commands to prevent them from crossing the boundary. After a few days of initial training, your system is ready to be activated. Your pet will experience the reminder zone, about three to six feet from the boundary, where audio commands or a mild stimulus will be sent to the collar. After a few weeks, your dog will grasp their new limits and roam about them! A dog is meant to be your best friend for life. Never worry about your dog escaping the yard again with a hidden fence: MO residents can purchase an underground fencing system and put their minds at ease today!